I should be better at eating my vegetables but I’m not, so to motivate myself to eat veggies more often I like to keep the recipes simple but flavorful. 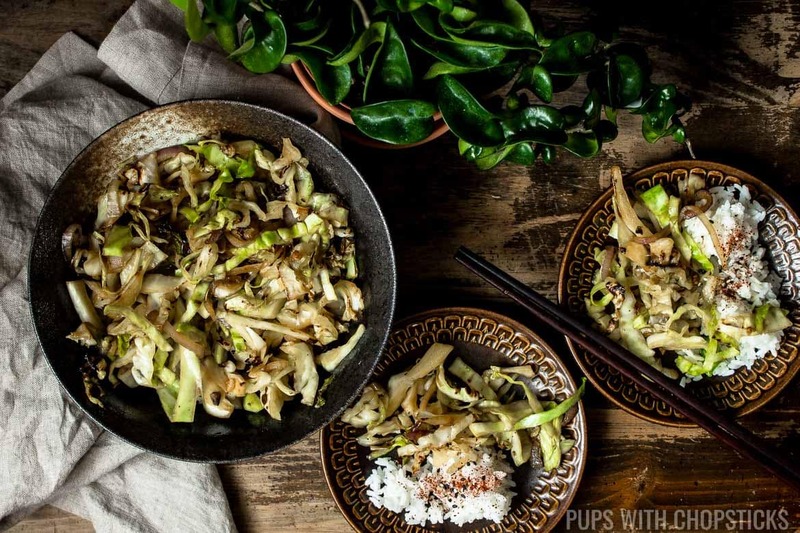 Personally, I find cabbage and brussels sprouts very similar in texture and flavor and I find that a bit of char really brings out the nuttiness to this vegetable so it’s no surprise that there’s also a bit of char in this recipe. 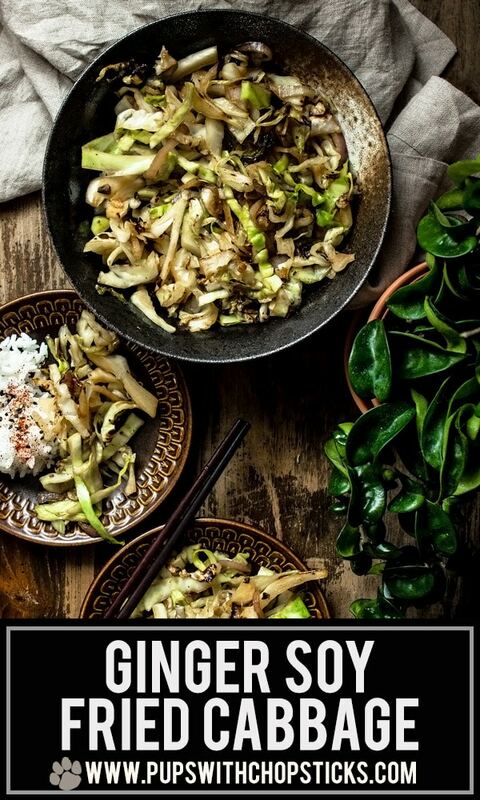 When cooked, cabbage has a natural sweetness to it, so I enhanced the sweetness a bit more with a sweet ginger soy sauce which brings everything together quite well. 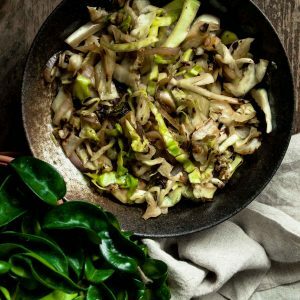 There is no meat in this dish, since I chose to keep it strictly vegetable to make it a side but if you want to make this into a meal you definitely can add some meat in – leftover meats especially work great with this fried cabbage recipe. 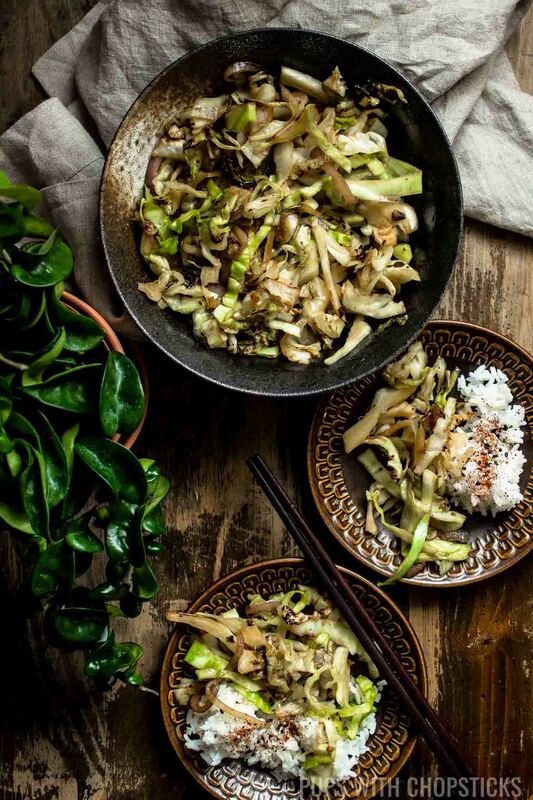 For this sweet ginger soy fried cabbage recipe, almost all ingredients can be found at your local grocery store with the exception of dashi powder. 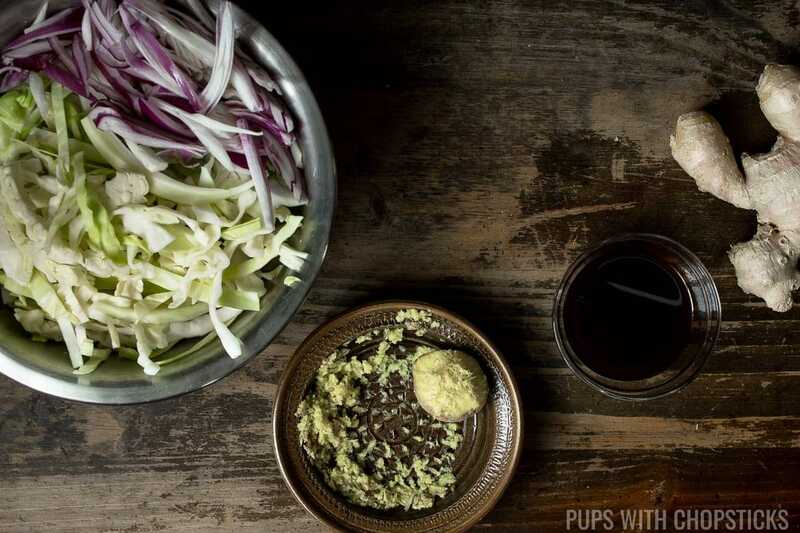 Dashi powder can be found online, or at an Asian grocery store – I usually find mine at a Japanese or Korean grocery store. 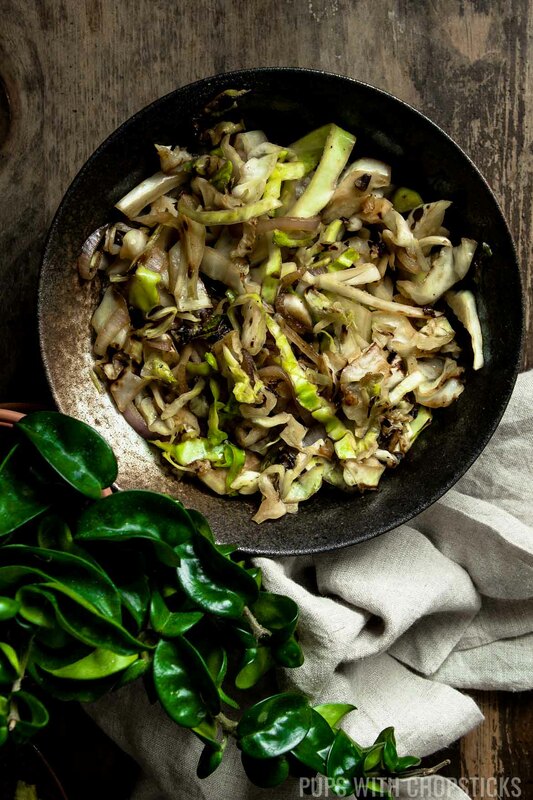 Personally, I find cutting cabbage to be a bit of a pain because of how tough it is to cut through and how wobbly it can be but once I get the core out – cutting it is a breeze. 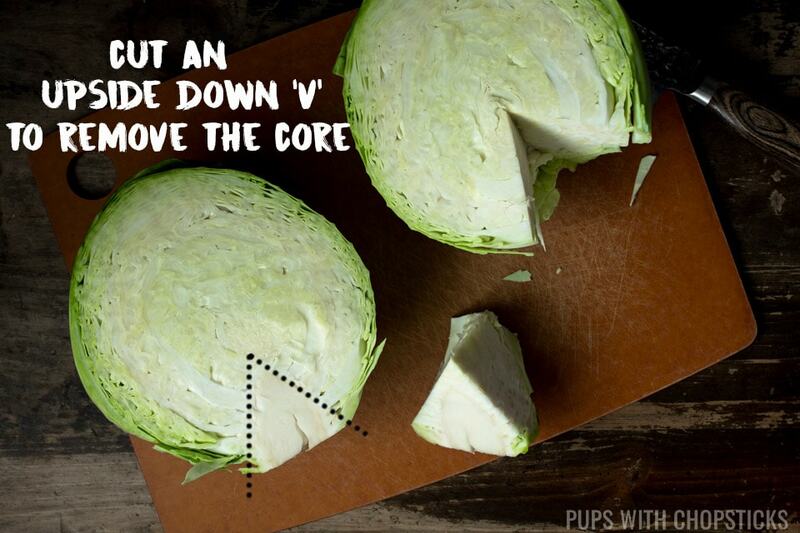 To cut out the core, I like to first cut the cabbage in half. Once I cut it in half I cut an upside ‘V’ out of the bottom to remove the core. Once the core is out, I usually like to cut the cabbage halves into half again before slicing for smaller bite sized cabbages leaves. Do You Really Need to Grate the Ginger? No, you don’t have to grate the ginger, but if don’t then you should keep the ginger intact in larger slices. 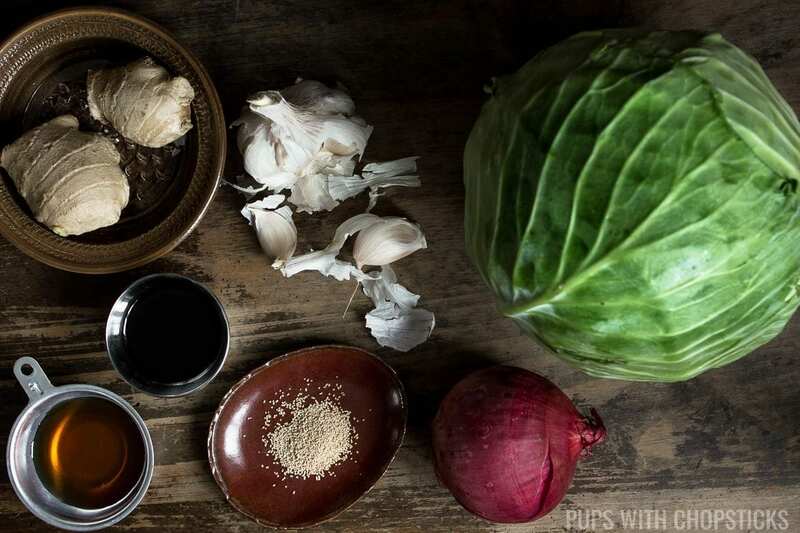 Grating the ginger helps spread the ginger flavor into the cabbage and the sauce without biting into large chunks of ginger (which can be overpowering) while you are eating the cabbage. Not everyone has a grater small enough to grate ginger though, so to work around that you can slice the ginger into large slices. That way, you can still brown the ginger in the beginning with the garlic to infuse the oils with ginger flavor and when you are finished cooking, you can easily fish out and discard the large ginger pieces. Grating the ginger helps spread the ginger flavor throughout the dish so that you don’t bite into chunks of ginger (which can be very overpowering). If you can’t grate the ginger, cut it into slices instead. 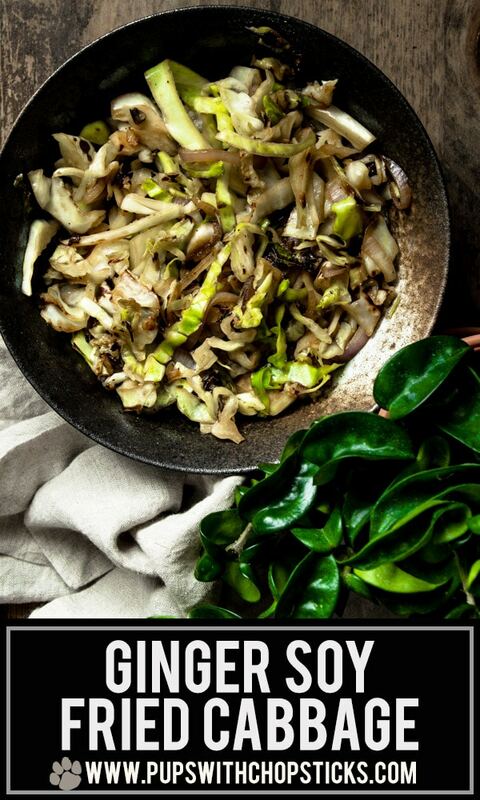 Once you are done cooking, you can easily remove the ginger slices before serving the cabbage. I have tested this recipe with ginger powder and it works great! 🙂 If you can’t get a hold of fresh ginger, substitute it with 1 teaspoon of ginger powder.